Constantly being in the limelight must be tiring, especially when every inch of your appearance gets picked apart and offered up for public consumption. You only have to open a magazine or scroll through social media to find criticisms of people’s bodies everywhere; whether they’re described as too fat, too skinny, too fake, too plain, it doesn’t matter. Nothing is sacred. And it seems Madonna has had enough because she has called out body shamers in the most perfect way, after a recent performance she did led people to question whether she has bum implants. The performance in question took place on New Year’s Eve when the Vogue singer made a surprise appearance at New York’s Stonewall Inn gay bar to mark the 50th anniversary of the Stonewall Riots. 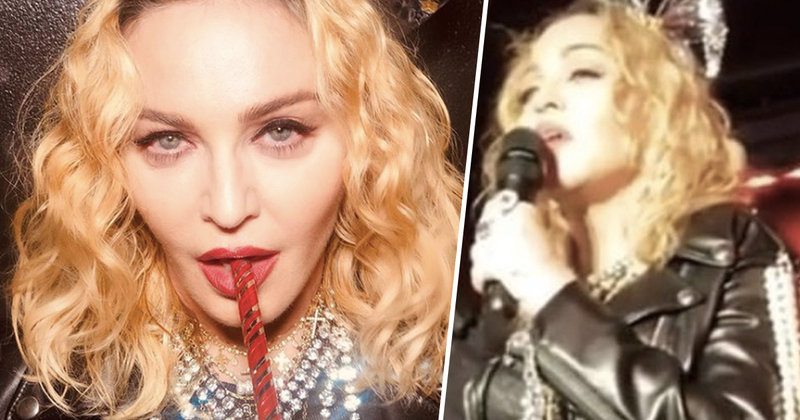 Taking to the stage alongside her 13-year-old son, David Banda – who played the acoustic guitar – all eyes were on Madge as she performed classic songs Like a Prayer and Can’t Help Falling In Love. But some eyes were in the wrong place, as the performance sparked rumours that the 60-year-old had got bum implants without telling anyone. As pictures and footage of her surprise appearance began circulating on social media, people made their opinions clear regarding the singer’s alleged surgery. I understand it’s hard for us women growing older wanting to make the best of how we look. But your 60 now. Grow old gracefully and leave the young ones to getting the bum implants. They all look silly. Haven’t seen one that looks natural. I understand it's hard for us women growing older wanting to make the best of how we look. But your 60 now. Grow old gracefully and leave the young ones to getting the bum implants. They all look silly. Haven't seen one that looks natural. The consensus was, people wanted to know whether she had got bum implants and if so, why she had made that decision in the first place. But Madonna wasn’t here for people’s criticism, no sir. Because yesterday (January 3) she took to Instagram to share a selfie of herself taken on the night in question, calling out anyone who had an opinion on her body. I mean, I couldn’t have put it better myself to be honest with you. Neither confirming or denying the rumours, the Queen of Pop shut down all the critics with a perfect f*ck you. I reckon the comments will keep on coming but Madge has already proven she’s rising above the haters. Just like a true queen would. You keep doing you, girl.